Around the country, a growing number of builders are forgoing traditional wood-studded walls for packing foam — the same material used in coolers and take-out containers — and snapping it together like Legos. 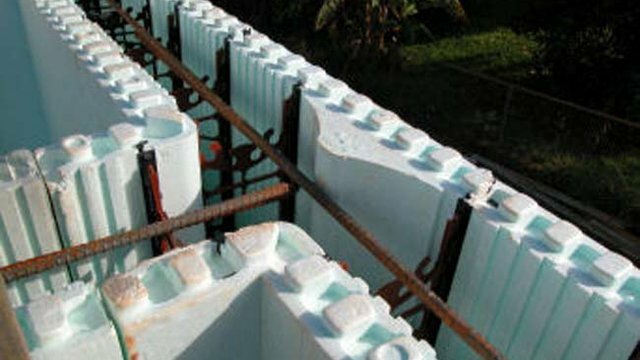 The technique, known as ICF, or insulated concrete forms, makes use of polystyrene foam blocks with teeth on the top and slits on the bottom. The blocks are fit together along parallel lines eight to 10 inches apart, and concrete is poured in the middle. The polystyrene insulation completely seals out the elements, making ICF one of the most energy-efficient construction techniques available today. Leigh Overland, an architect in Danbury, Conn., recently designed the city’s first ICF project: a two-story building on Main Street that will house a pediatrics office on the first floor, according to the Danbury News Times. The 3,200-square-foot building will add to an increasing list of ICF projects in Connecticut. Overland’s largest such building is a Scottish-style castle that was built in New Canaan last year, the paper said. The polystyrene material is fireproof and can outlast severe weather, Overland said. The ICF material has been around for many decades, used mostly in Europe and Canada. ICF construction has been growing at 25 to 30 percent a year in the U.S., according to a report issued last month by Mordor Intelligence, a market research and consulting firm, which said the technique is “revolutionizing” the construction industry. “ICF building envelopes can reduce the heating and cooling component by up to 70 percent compared to other materials used, making it the single biggest and most cost-effective cut in a building's total cost,” the report said. States like Rhode Island, Texas and California have seen the biggest growth in ICF building, Overland said. James Ryan, owner of ICF Building Company, which sells ICF products, told the News Times that when property owners first hear the word foam, they wonder if their building “is going to blow away.” But once they learn about the benefits, they often choose to go with it. “The strength of the building is a big plus,” he said. The U.S. Department of Housing and Development describes the structural strength of ICF buildings as one of its most notable benefits, especially against hurricanes and tornadoes. ICF costs “virtually the same” as conventional building methods, Overland said, but prices are going down as more and more people opt for the new technology. The biggest savings, he said, come later in the electricity bills. “We’re seeing that it’s saving our clients between 60 and 75 percent,” Overland said.